The book under review is the fourth volume in Rodopi's Conrad Studies Series overseen by Allan H. Simmons and J. H. Stape. The present volume, edited and introduced by Richard J. Hand, not only includes the play-text of Victory but also the annotated contemporary reviews, the censor’s report, reproductions of the programme and production photographs. The volume reflects the growing interest in Conrad’s plays and their revaluation both in the context of the writer’s oeuvre and the early twentieth-century literary and theatrical scene. One of the pioneers in this new field of Conrad Studies is Richard J. Hand, whose groundbreaking study The Theatre of Joseph Conrad appeared in 2005 and who has since also edited, together with Katherine Isobel Baxter, the collection of essays Joseph Conrad and the Performing Arts (2009). It would therefore be hard to find a scholar better suited to introduce and edit Conrad’s or, rather, Basil Macdonald Hastings’ Victory. Hand’s introduction – which is developed from the respective chapter in his earlier study – is concise but wide-ranging, exploring Victory, the play, from multiple-perspectives. He takes his starting-point from Conrad’s rather ambiguous and fraught relationship to the theatre. Even though Conrad made numerous disparaging remarks about the theatre, he was nevertheless drawn towards it on several occasions during his life. In 1902, for instance, he turned his short story “To-morrow” into the play One Day More, and in 1920 he not only adapted The Secret Agent and “Because of the Dollars” (as Laughing Anne) for the stage but also wrote the screenplay Gaspar the Strong Man. What Hand calls Conrad’s “dramatic year,” 1920, might indeed have been triggered by the popular success of Victory, which premiered at the Globe Theatre on 26 March 1919 and ran for 89 performances until 6 June 1919. Victory, of course, is not a self-adaptation but “was done” by the minor playwright and RAF officer, Basil Macdonald Hastings. As the extensive correspondence between the two writers shows, Conrad took an active interest in the process of adaptation, even though he was adamant that the prospective play should not be regarded or advertised as a collaboration. In retrospect, Conrad’s decision proved felicitous as all the adverse criticism of the play – which stands in contrast to its popular success – was directed at Macdonald Hastings and not the famous writer, whose novel was invariably regarded as far superior to the adaptation. In his 1927 memoir Macdonald Hastings felt called upon to set the record straight on working with Conrad and claimed that the most controversial change he had introduced – the happy ending – was suggested by Conrad himself, an assertion that, as Hand points out, is supported by Conrad’s letters. Although the new ending befits the conventions of the kind of popular melodrama the adaptation also adheres to in many other respects, it was picked out by the critics as particularly offensive. After all, the play’s ending seems to turn the novel’s sombre message its head. Whereas in the original Davidson reports that Heyst’s last words to him were “woe to the man whose heart has not learned while young to hope, to love – and to put its trust in life,” the adaptation is concluded by Lena’s triumphant words to her lover that he has now “learnt before too late to hope, to love, and put his trust in life!” Lena’s victory and Heyst’s “learning process” are achieved at the expense of knifing two men and shooting a third. As the reviewer of the Evening Standard pointed out the play’s moral thus “distinctly advocates the advisability of finding someone to kill.” Richard Hand adds that the “happy ever after” conclusion makes “the play seem like a work of triumphalist jingoism and imperial masculinity in a post-war world.” Indeed, it appears that the union between the play’s “clean young Englishman” (Daily Express, 27 March 1919), Stephen (!) Heyst, and the pure and innocent English girl, Lena, is founded upon the exclusion of “the Other”: the filthy, sensual German Schomberg, the misogynist and possible homosexual Mr. Jones, the Cockney “cat-man” Ricardo, the “monkey-man” Pedro, and the mysterious and clownish “Chink” Wang. The problematic stereotyping of characters already found in the novel is even more pronounced in the play and, as the fascinating performance stills included in the review-section show, the characterisations in the stage directions were almost literally taken up by costume and make-up designers. Most astonishing is the portrayal of Pedro (Lester Gard), who looks like a forerunner of the inhabitants of the Planet of the Apes. In his introduction Hand also throws a thought-provoking light on Mr Jones’s possible homosexuality. Both in the novel and the play Jones’s sexual orientation can only be inferred but, as Hand convincingly shows, certain dialogue passages in the adaptation bring this orientation more to the surface. It is also remarkable that Jones and Ricardo’s motive to come to the island is not just the prospect of Heyst’s “swag” but an interest in getting to know the two people on the island. 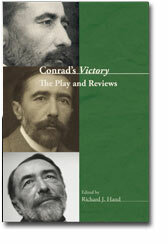 The merits of the present volume lie in Richard Hand’s engaging introduction and in making not only Victory but also a great wealth of additional contemporary material available to the increasing number of scholars working on Conrad’s plays and on the writer’s contemporary reception.